You know those days when your not sure what to make for dinner? When you don’t really have enough ingredients in the fridge to make a full meal because you have been neglecting going shopping? Those are the days when quiche is a perfect option. It is a one-pot dish that can be made fairly quickly and put in the oven to forget about for 30 minutes. I love quiche because it can be eaten any time of day. It is great hot out of the oven, cooled down, or left over. And the best part? Kids love it, and it is a great way to get some veggies in their day. 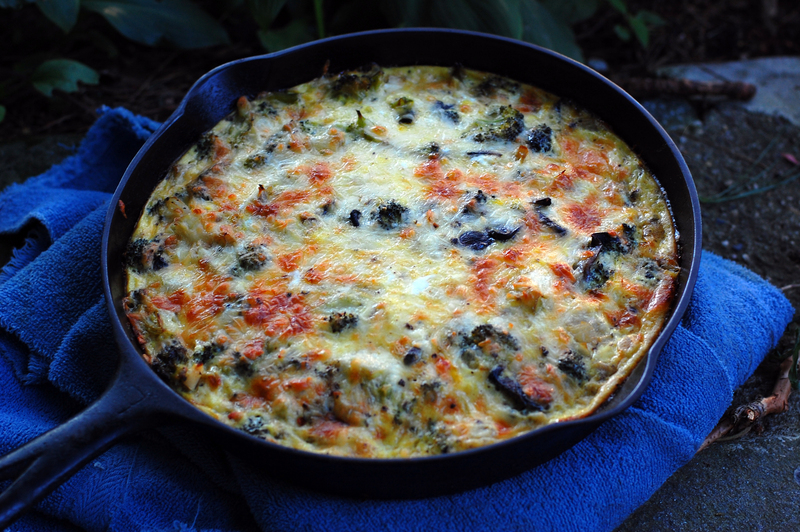 We (and I would guess most of you) almost always have eggs on hand, so whipping up a quiche is no big deal. Using fresh vegetables is ideal, and shouldn’t be hard to come by. ‘Tis the season for locally grown food. All in all, this took me about 1 hour (including 1/2 hour cook time). Simply saute your vegetables and set aside. Whip up some eggs, milk and spices. Pour eggs over sauteed vegetables and cheese. And bake for precisely 30 minutes until golden. 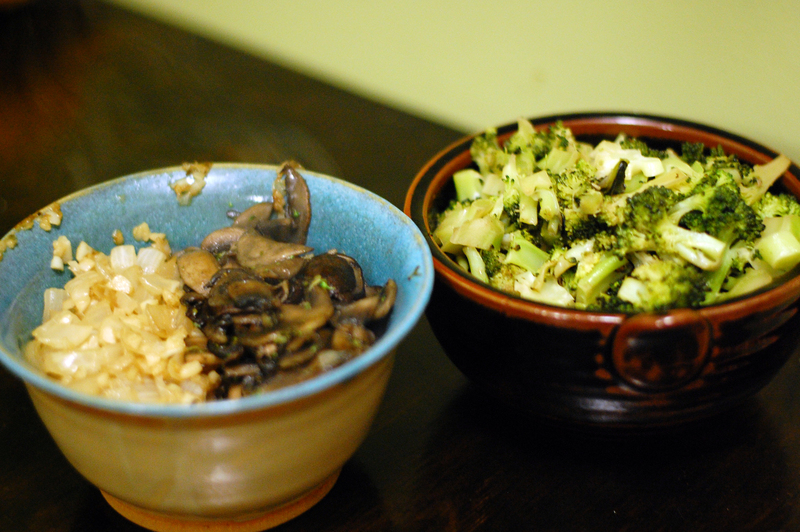 This time we had some broccoli and mushrooms in the fridge that both needed to get used, plus onions and garlic because they make any dish better. 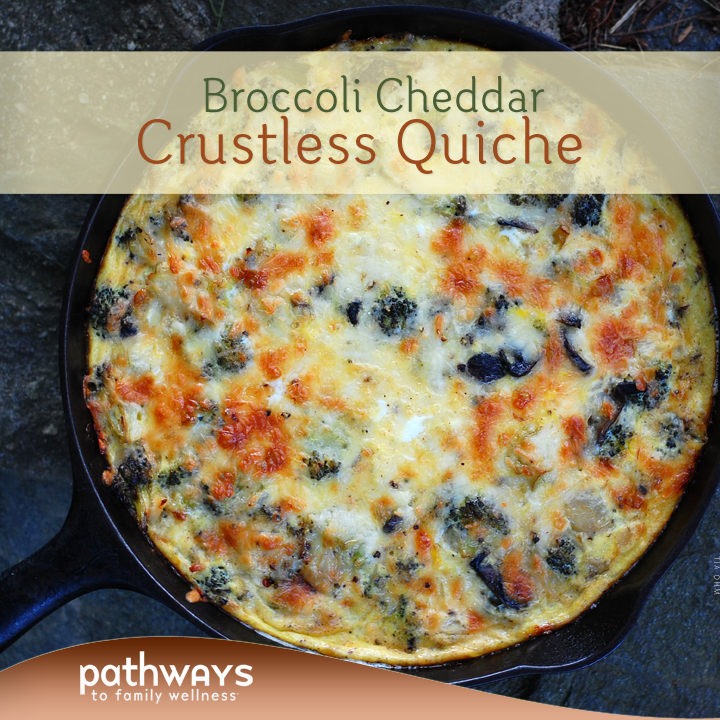 You can omit the mushrooms here or add some spinach, but the combination of broccoli and cheddar is a must. Start by melting 1 T butter in a cast iron pan (does not have to be the same one you bake with). Add your diced onions and saute for a couple minutes. Add garlic, a dash of salt and pepper and caramelize. Set aside in a bowl. Melt another T butter in your pan. Add broccoli, salt and about 1/4-1/2 cup of water. Cover and let steam for about 10 minutes or until it is soft. Set aside in a separate bowl. Melt 1 T butter in pan and add mushrooms and some salt. Saute until wilted, stirring occasionally. Set aside. Grease your baking dish/cast iron pan with olive oil. 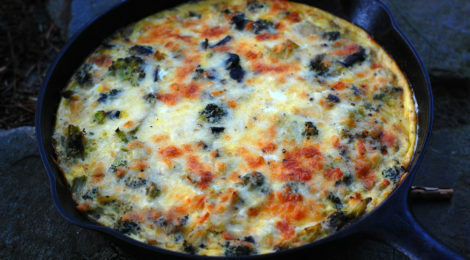 Add your broccoli, mushrooms, onions, garlic and 3/4 cup of your cheese into the pan and mix. Top with your remaining amount of cheese so you have a nice cheesy layer on top. 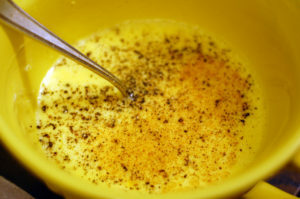 In a separate mixing bowl, beat together eggs, milk, salt, pepper and nutmeg. 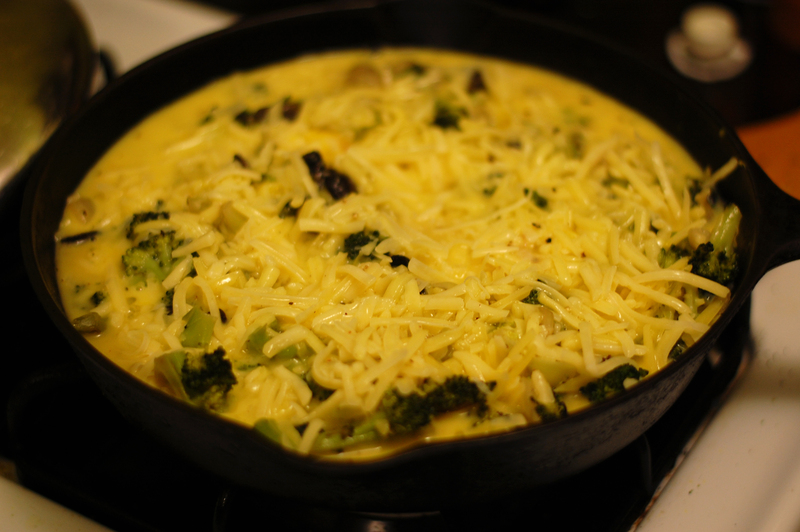 Pour mixture evenly on top of your vegetable/cheese mixture. Bake in preheated oven for about 30-35 minutes or until slightly golden. We cooked it for about 30 minutes and it was perfectly cooked (we like it a bit under done). Serve warm.